HashCash is probably the only player in the market that runs a Cryptocurrency exchange at a large scale and offers the same software to other clients who are interested in running their own cryptocurrency exchange. Cryptocurrency traders come from across a wide range of age groups. From teenagers to older and seasoned traders are drawn to the promise of earning big rewards in a short span of time. To enable traders to practice this concept on a trusted cryptocurrency exchange platform, the leading global crypto trade exchange, PayBito has added another major cryptocurrency to its coin list – Ethereum Classic. 2) Proof that the technology works – The engineering and product quality can be gauged by the existence of a working alpha or beta product on a test net or main net. A verified documented peer-review and testing by contributors separate from the initial development team further strengthen this conviction. 4) The Consensus mechanism and future revenue generation system – The coin should have a convincing process to process definition for implementation of major code updates or voting process for conflict resolution. It should be backed by a business plan that can draw in funds beyond that which was raised from an ICO or from traditional investors. 6) It should have favorable Market Distribution analysis – This includes data on Market Capitalization, Asset Velocity, Circulation, and details on where the asset would be available for trade. 7) It should have favorable Market Demand – This includes demand from customers, developers and contributors, and external stakeholders. Cryptocurrency trade is a head-turner in the financial space because of its similarity in dynamics to the traditional equities. 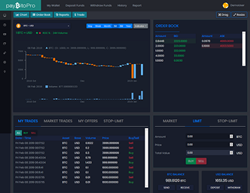 PayBito’s practical User Interface is easy to navigate and provides quick access to a number of features on the exchange. It supports USD deposit and withdrawals and leading cryptocurrencies including Bitcoin, Bitcoin cash, Litecoin, Ethereum, Ethereum Classic, Bitcoin SV, HCX, several ERC20 tokens, and their trading pairs. The 24 hr trading volume on PayBito at the time of writing this article is 6.2 million. HashCash Consultants – the parent company of PayBito – is a known name in the financial circle for its expertise in blockchain based banking solutions. PayBito has been instrumental in providing an authentic opportunity to enterprises with tokenized services to trade on a global exchange, alongside other thoroughly vetted cryptocurrencies.